Videos and words don’t really do justice to Distance. It may be the most instantly exciting, absorbing game I’ve played all year. But let’s start with the basics. 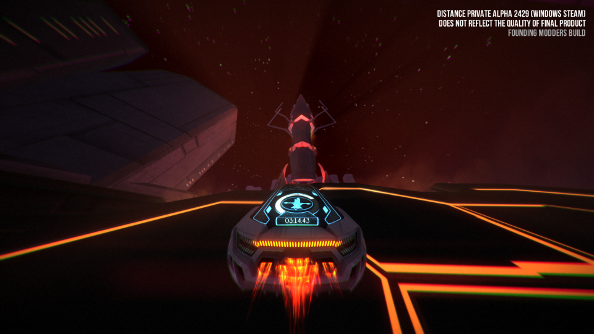 Distance is an arcade racing game that channels the sense of speed and danger that made F-Zero a legend on SNES, and then marries that to the visuals and music of TRON and the possibilities of Portal. Within a few minutes of sitting down to play it at PAX East, everything else in the world had ceased to exist. The show floor was silent. My friends were gone. It was just me, the road, and the music. 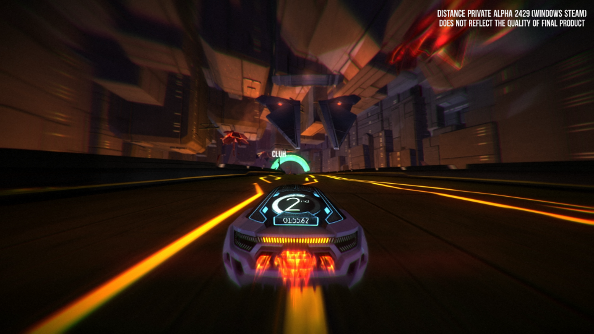 Distance comes from Seattle-based indie developer Refract, and it’s comprised of former DigiPen students who worked together on a number of games including Distance’s direct ancestor, Nitronic Rush. Both games are their nod to 90s arcade racing games. At first, Distance seems very familiar. 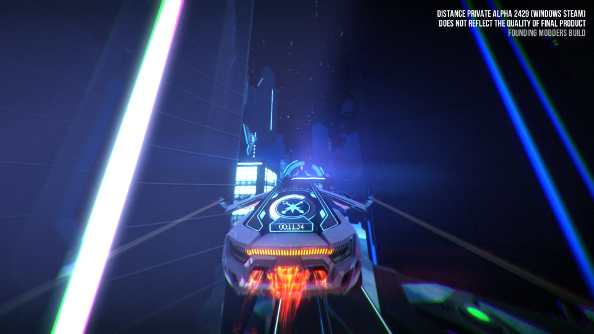 You start off with some kind of supercar driving through a neon-lit city. In keeping with the TRON-style visuals, there is a hint that your car is a malfunctioning piece of some kind of supercomputer. The tutorial was easy at first, teaching me that my car could jump obstacles and use a speed boost. But then the twists start coming in. The obstacles got harder, including spinning orange buzz-saws and grids of menacing red lasers. Then portals appeared on the road to instantly warp me from one part of the track. Maybe it’s a shortcut, or maybe I should have driven around them. It’s hard to say, especially travelin at the speed of thought. You make a choice, flick the thumbstick, and launch yourself into the next set of problems. I’m not sure speed has ever felt so good as it does here. As I went faster and faster, juking seemingly impossible obstacles and vaulting chasms in the roadway, Distance seemed to wrap me up in a cocoon of speed and excitement. The driving beat of the electronic music synced up with pulsing of the neon skyline and the flicker of energy from my booster. This might be Distance’s most impressive feature, the little touch that makes every moment feel like a legend in the making. The perfect alignment of sound, music, and visuals amplified my urgency even as they further locked me into the game’s rhythms. Distance probably made me feel like a sharper driver than I actually am, just because I felt like a complete hero every time I whipped the car past a whirling saw or vaulted over a wall. 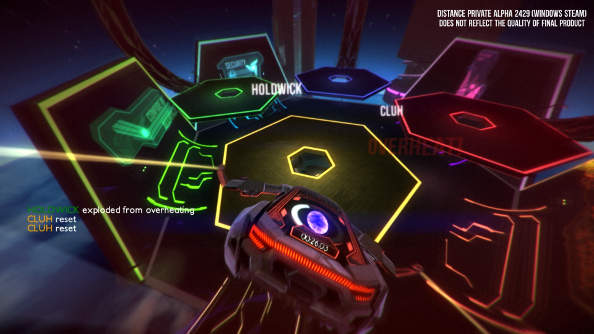 I also loved how Distance just kept throwing new wrinkles into the game. I was stunned when I went hurtling off one ramp into the abyss only to have tutorial text politely inform me that, oh yes, your car can freaking fly. Flight is much slower and more relaxing than racing along the surface of the roadway, but it comes at a cost: your car rapidly overheats if it’s off the track surface for too long. So while flying can probably let you cut the track if you find the right shortcut, it’s slower and more dangerous if you misuse the ability. Nor does gravity really apply to your car. I was headed for disaster inside a tunnel, unsure of how I was going to beat a maze of laser beams, when I juked too hard to the right and my car rocketed up onto the ceiling of the tunnel. The camera followed its new orientation and suddenly I had a completely clear path along the ceiling. That’s the one constant of Distance: unexpected freedom. It’s a racer built with even less regard for the laws of physics or reason than normal, and absolutely no explanation. I could have raced from checkpoint to checkpoint forever, but that’s only the surface of Distance. 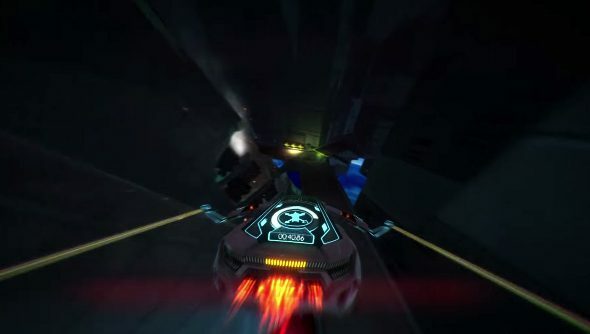 The full game includes a massive level editor that sounds like it will put Trackmania to shame, and multiplayer is a major element that can totally recast the feeling of the game. Unfortunately, Refract are very much a “it will be ready when it’s ready” team, so Distance does not yet have a firm release date. However, its positive reception at PAX has left the team with something to think about.